With 10-16 named storms forecast, NOAA predicts the 2018 Atlantic hurricane season will be near or busier than usual. LAKELAND, Fla. -- We'll get through this, together: NOAA forecasters predict 10-16 named tropical systems this upcoming hurricane season. This is considered a near or above-average seasonal forecast, and the time is now for people along the U.S. coastline to prepare, NOAA says. It is important to note, however, the number of storms does not mean each one will make landfall. All it takes is one land-falling storm to create significant damage. The year 1992, for example, had just four hurricanes and one was particularly devastating: Hurricane Andrew. NOAA has released its outlook for the 2018 Atlantic hurricane season. Forecasters predict a near or slightly above normal season with 10-16 named storms, 5-9 hurricanes and 1-4 major hurricanes. NOAA forecasts of those 10-16 storms -- which are tropical storm strength with 39 mph winds or greater -- five to nine could become hurricanes, with winds of 74 mph or greater. And of those, one to four could be major hurricanes. Those are ranked on the Saffir-Simpson Scale from Category 3-5, with winds of at least 111 mph. An average season produces 12 named storms, with six of those hurricanes and three major hurricanes. Already before the official June 1 start of hurricane season, the National Hurricane Center and 10Weather meteorologists are keeping watch on a Caribbean disturbance churning its way toward the Gulf of Mexico. Forecasters expect it to become the first named storm of the year, which would be called Alberto. 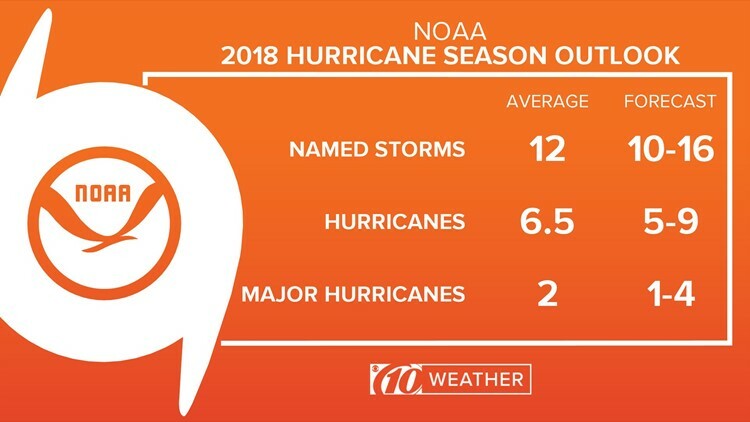 "We're not expecting this season to be one of the most active on record," said Gerry Bell, the lead hurricane season forecaster with NOAA's Climate Prediction Center. "There's no strong climate signal saying it's going to be extremely active like last year or extremely weak. "We're expecting a near-average season, which means a lot of storms forming in the Atlantic, which again means this is time to start getting prepared." 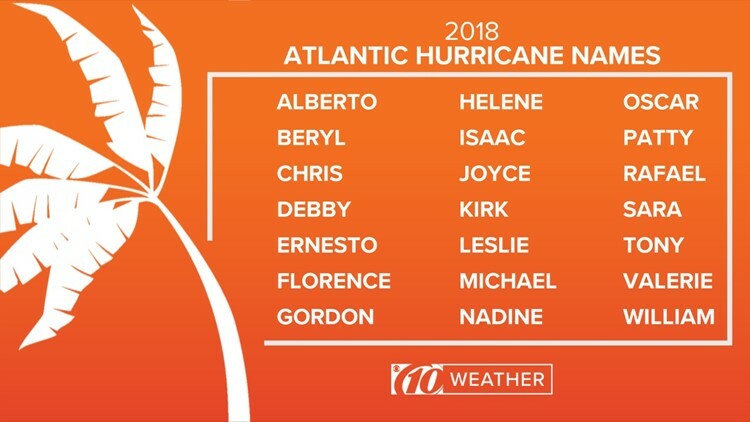 This is the 2018 list of Atlantic hurricane names.